CHIREDZI - Chiredzi District Administrator (DA) and chairperson of the Civil Protection Committee, Lovemore Chisema was recently full of praises for the Hippo Valley Productive Sugarcane Association (HVPSFA) which he said had taken more interest in the welfare of less fortunate members of society. This was after the association sourced $3 000 worth of groceries and other goods as a Christmas gift to child patients admitted at Chiredzi General Hospital. The hospital is hard-hit by shortages of drugs, food, equipment and space for patients, a factor that makes it a critical charity case in the whole district. HVPSFA’s donation came as the pediatric section of the hospital face other problems of its own, making the provision of effective treatment of children all the more difficult. Among many other things, the association donated bathing buckets, bathing and washing soaps, toothpaste, toothbrushes, sugar, soft drinks and snacks. 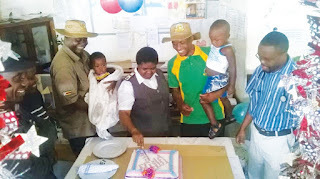 Chisema, who was the guest of honour at the handover ceremony, hailed the association for the gesture and challenged other organisations and individuals to commit their own time and resources towards the improvement of welfare among the needy. "Doctors treat but God heals. As an association, HVPSFA has contributed towards the healing process of these children while they are still in the hospital and when they get discharged. “We appreciate this act of generosity and care for the wellbeing of others. It is not the duty of only non-governmental organisations to provide this kind of assistance. All members of society should bear this noble responsibility,” said Chisema. HVPSFA chairperson, Marius Dzinoreva said the organisation always found pleasure in doing acts of kindness to the less fortunate and will continue to work hard to do more. "We agreed as an association that we must prepare a special gift to the children admitted in the hospital so that they too could have a reason to smile. This is in accordance with the teachings of the Bible which requires us to love others the same way we love ourselves,” Dzinoreva said. HVPSFA draws its membership from the many indigenous sugarcane farmers who acknowledge the importance of working together to advance their interests while helping each other to be better farmers.